← How Can a Mobile App Help Me Learn? Let’s say you are a student. You have a wonderful mobile education app. You’ve used it as a self-learning tool. It’s neat. It’s cool. You wish that all learning could be so fun. You may even show it to your teacher. You enter your traditional classroom. It’s no longer that traditional. Everyone has a mobile. Everyone uses it. You pluck up courage and show your teacher the app. What is your teacher’s reaction? How would you like it to be? Some teachers would feel intimidated. Some would feel that there is no room in the busy classroom, where standardized tests are looming over their heads, curriculum must be covered and the administration is constantly looking for measurable improvements. But some teachers would take another stance. They would look at this as an opportunity. And that teacher could be you. But then, you ask yourself, what should I do with this new-fangled thing called mobile education? And here is the art. How can a teacher leverage mobile learning apps in the classroom for better education? How can the mobile actually be used in the classroom as a positive facilitator of learning, and not just a pretense for playing? Traditional education is focused on serious teaching – making your students learn facts, master skills, get better grades. 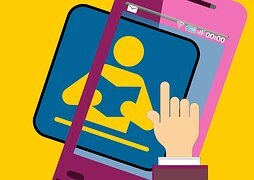 Mobile learning is focused on playing – having a great user experience, seeing neat graphics, feeling the tingle of all the bells and whistles. But there can be a serious side to all of this. The best learning tools are those that can marry the ‘play’ aspect and turn it into a serious learning endeavor. I call it BlendEd. What is BlendEd? It is the judicious blending of ‘fun’ and ‘serious’ activities in the classroom in order to pave the way for a better learning environment. It is wisely choosing apps that you allow to ‘fit into’ your regular course curriculum. It is the calculated scheduling and balancing of activities in your classroom so that you can keep up with the course syllabus and administration requirements, yet allow some designated time for your students to ‘let their hair down’ and really play with the material. And this is what good mobile learning apps do best. They foster a game-like mentality where learning is ‘by the way’, and not a hard, hated path that your students are forced to slog through. So why use BlendEd? Simple. To ease your students’ fears of certain subjects, like English or math. To let them feel in control. To let them have fun where they have never had fun before! In short, to help bury your students’ traditional antagonism towards learning, and foster within them a new and positive path of personal development. The real goal? To create a new outlook in your students – one that will enable them to help themselves to learn more. Learn more by themselves? Hey, isn’t that how we started this little piece? This entry was posted in Uncategorized and tagged education, English, English learning, mobile, mobile education, students, teachers. Bookmark the permalink.